We’ve made wholesale workflows more efficient, compliance more reliable, and data more accessible. 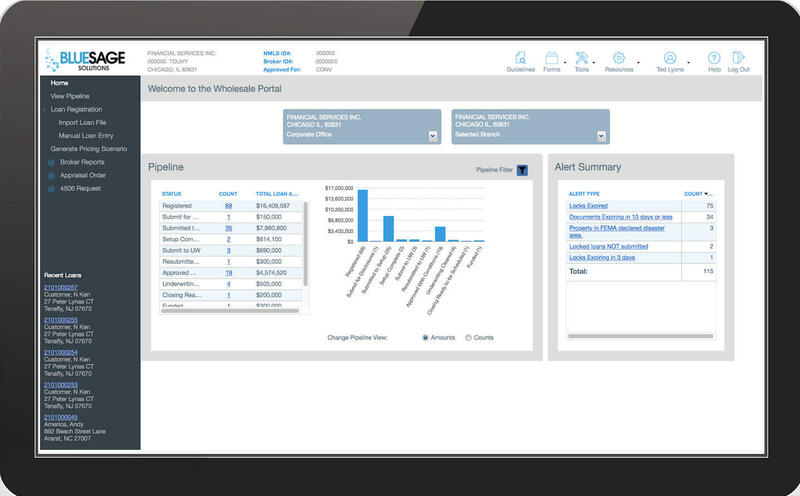 Configurable, fast, and secure, our broker portal, mobile integration, management tools, and LOS help tasks get done and keep pipelines flowing – automatically, quickly, and with zero lag time. Everything wholesale in just one place. Our self-service broker portal makes you a part of the loan process, and onboards transactions to the Blue Sage platform – automatically, at digital speed. Fully loaded, the portal is the gateway for simple, single-system lock management, user and password maintenance, fee configuration, 1003 data management, and more. 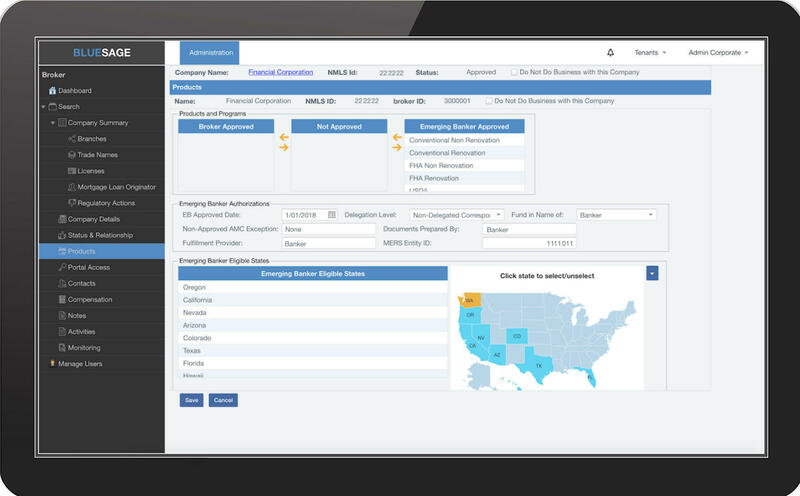 Our self-service Broker Management System manages all your brokers from one simple place. Easily add your Broker Companies and their associated branches, then quickly set up statuses and relationships, compensations, products, QC monitoring and Risk monitoring. You’ll be able to work with them in the capacity of Broker, Emerging Banker – or both – and get real-time access to essential information including their current and historical licensing, trade names, regulatory actions and MLOs. Access your portal from anywhere. We took the Broker Portal and scaled it for smartphones and tablets. Everything is there, synched on the cloud, so you can work on the move without leaving your database. Automate every step. Fast, secure, and always up and running, our wholesale LOS supports the entire set up, fulfillment, underwriting, closing, funding, and post-closing process. Cloud-supported and browser-based, our team designed it from the ground up to support the entire process, cradle to close.